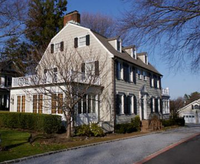 The swarming flies, the demonic pig, the ooze seeping through the walls and floorboards ... the house (above) that was once called 112 Ocean Avenue in Amityville, Long Island, has been a staple of Hollywood for decades. 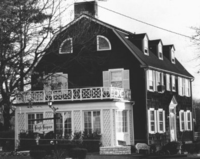 Though you’re probably aware the supernatural film series is allegedly based on true events, there are plenty of creepy facts about the “Amityville Horror” case you may not know. The movies never tell the full story – and it turns out the whole thing is even more complicated than most people think. When we talk about the Amityville Horror case, we’re really talking about two cases: the mass murders committed by Ronald “Butch” DeFeo, Jr. in November 1974, and the experiences of George and Kathleen Lutz in December 1975. after they moved into the house where those murders took place. On Nov. 13, 1974, all members of the DeFeo family – save Butch – were found murdered in their beds. Ronald Jr. was later arrested, tried for the killings and found guilty Nov. 21, 1975. 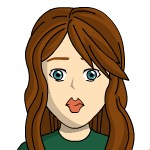 Just a month after the conviction, the Lutzes moved into the house and well ... as they tell it, things didn’t go exactly as planned. Still, it’s impossible to talk about the alleged haunted house without discussing the murder and vice versa. The two are inextricably intertwined and each is chilling in its own way. Following are some of the weirder aspects of both. Sometimes truth really is stranger than fiction. The DeFeos were all found in the same position. Ronald DeFeo, Sr. and his wife, Louise, were both shot twice with a .35 caliber Marlin 336C rifle. The four children, Dawn, Allison, Marc and John Matthew, were each shot once. All six victims were discovered in their beds, lying on their stomachs. It is estimated the entire scenario of events took a mere 15 minutes from beginning to end. The identical positioning of the bodies is creepy enough in and of itself, suggesting the victims were possibly arranged that way, but it gets even creepier. The police determined the rifle hadn’t been fitted with a silencer, so the gunshots should have awakened everyone in the house. However, there was no sign of a struggle, nor was there any evidence that sedatives had been used to knock out the victims to keep them quiet and this is incredibly weird. Additionally, neighbors didn’t report hearing anything that resembled gunshots, only the barking dog. There could have been a second shooter. But, more than likely, there wasn’t. At the time, investigators considered that more than one person may have participated in the killings because this made more sense than six people sleeping through the gunshot blasts. A second shooter has never been identified, though in 2012, a filmmaker found evidence supporting the theory. In the meantime, there are those who still consider the possibility that a second killer was involved. DeFeo later claimed “voices” told him to kill his family and a psychiatrist testifying for the defense at trial said Butch had a dissociative disorder, an indication he would have experienced the murders as if he were outside his body or “watching” it happen. However, the prosecution’s psychiatrist successfully argued that DeFeo actually had antisocial personality disorder, an indication he would have been perfectly aware of what he was doing, but had no regard for right and wrong. DeFeo was found guilty of six counts of second-degree murder and sentenced to six consecutive life sentences. His story has continued to change since his conviction. In a 1986 interview, he claimed his sister Dawn killed their father, after which their mother killed Dawn and the other children before turning the gun on herself. When his lawyers filed a 440 motion in 1990, he claimed Dawn shot the majority of their family members before he killed Dawn. He also maintains that his lawyer, William Weber, pressured him into the insanity defense. Regardless, his requests for parole have all been denied. The DeFeos’ furniture was sold with the house. According to the first chapter of Anson’s book, the furniture that had been in the house when Butch DeFeo killed his family was also purchased by the Lutzes for an additional $400. Others who knew George and Kathy claim the Lutzes purchased only some of the furniture, including that in the dining room, Dawn and Butch’s bedroom sets, a chair and other odds and ends. The Lutzes lived in the house less than a month. The Lutz family fled the “horror” house Jan. 14, 1976, after only 28 days. According to a Ghost Village interview in 2005, George said they did not realize when they left that they would never return. “We didn’t get up to leave that morning; you need to understand that,” Lutz insisted. “This was our house, we lived there.” After a night in which two of the children were badly frightened, Kathy called a priest they had been in contact with throughout the ordeal and he encouraged them to go somewhere else the following night to get some rest. According to Lutz, they had every intention of returning to 112 Ocean Avenue. However, after leaving his mother-in-law’s home, they boarded a plane for San Diego, leaving their belongings – which were later sold at auction – in the house. The infamous ‘Demonic Boy’ photo. Google “demonic boy photograph” and this is the image that pops up. 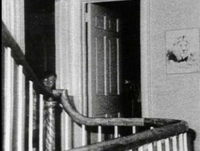 The picture, which seems to show a young boy with glowing eyes, was allegedly taken during Ed and Lorraine Warren’s investigation of the Amityville house and the Warrens claimed it was a photo of John Matthew DeFeo, who was 9-years-old at the time of the murders. Subsequent investigation found the photo was actually that of Paul Bartz, who, it is reported, admitted he was in the house when people were taking pictures. The glowing eyes are the result of infrared film. The entire ‘haunted house’ story was fabricated. In 1992, The New York Times, reported William Weber, Butch DeFeo’s lawyer, said he met with the Lutzes, who were interested in “developing the demonism aspect of the case.” Earlier, he admitted he, George and Kathy “created this horror story over many bottles of wine.” He was also interviewed by A Current Affair in 1988 and reported he and the Lutzes “took real-life incidents and transposed them” to create a spooky tale sure to make a splash. For example, they turned a neighborhood cat that had a habit of hanging around and peering in through windows into “Jody the pig.” Nevertheless, the Lutzes always denied their story was fabricated and in a 2013 documentary, Daniel Lutz, who was 9 at the time his family lived in the infamous house, insisted the events in the book and movie actually occurred and possibly resulted from George’s dabbling in the occult. In 2005, when the remake of the original film was released, Christopher Quarantino, Daniel’s brother, told The Seattle Times the haunting wasn’t a hoax, but that George had greatly exaggerated some of the incidents. 112 Ocean Avenue is now 108 Ocean Avenue. The last time the house (above) was up for sale in the summer of 2016, Jerry O’Neill of Coldwell Banker Harbor Light told the Washington Post the home had been owned by four different families in the decades since the murders. James and Barbara Cromarty, who purchased the house March 18, 1977, after it had sat empty for 15 months, requested the address be changed in order to discourage trespassers and people driving by gawking at their property. The Cromartys also sued the Lutzes, Jay Anson and the publishers of The Amityville Horror, claiming “false misrepresentations were made willfully and solely for commercial exploitation,” which had invaded their privacy. Eventually, the parties settled the matter for an undisclosed amount. The Cromarty family lived in the Ocean Avenue residence for 10 years. On August 17, 1987, Peter and Jeanne O’Neil bought the house and during their tenure, they replaced the infamous jack-o-lantern-eye windows and filled in the DeFeo swimming pool. Approximately 10 years later, the O’Neils sold the residence to Brian Wilson, who purchased the dwelling for approximately $310,000 in June 1997. Wilson made significant improvements to the property and added a sunroom. After 13 years, in September 2010, Wilson sold the house to David and Caroline D’Antonio. David, a former teacher, was at one time president of the Amityville Historical Society. According to Zillow, the house sold for $605,000 in February 2017. So far as is known, George and Kathleen Lutz are the only owners who ever reported any paranormal activity on the premises. Sources: Lucia Peters, Bustle, June 2017; The Truth about the Amityville Horror; and The Amityville Horror Conspiracy by Stephen Kaplan. The identical positioning of the bodies is creepy enough in and of itself, suggesting the victims were possibly arranged that way, but it gets even creepier. Is the writer saying that they were arranged that way before or after death? The autopsies showed that they had all been shot in the back and the bullets exited through the front. There's always the possibility he made them turn over before shooting them because he couldn't look them in the face. I agree, how odd, that six people killed and none of them got up at any time to see what was going on after hearing the shots, nor did they try to defend themselves. What possible speculations/explanations are there for that, other than perhaps DeFeo having a second shooter assisting him, if there was no silencer or sleeping aids used on the victims? Anyone have any theories? I don't think that there was a second shooter. It could be like Joanna said. He could have shot the parents first, then told the others that if they stayed in bed and didn't move that they would be safe. Also if they awoke from a deep sleep, they wouldn't be completely aware of what was going on. If there had been another shooter, DeFeo would have tried to blame it all on that person. If you wanted to buy windows like those in the Amityville Horror house, what would you look for? How would you describe what kind of windows you want? I've never thought about it before, but now I want to know too. It's called a "quarter-round" or "quarter-circle" window. Are you going to build a house with that type of windows? I like those windows. They give a house character. I can't understand why the people who bought the Amityville Horror house in 1987 changed the windows when it had been 13 years since the murders in 1974. I'm not building a house, but we're thinking about buying a house that was damaged somewhat during Hurricane Irma that has a roof like the one on the Amityville Horror house. Does anyone know what that kind of roof is called? If we buy it, I thought that while the repairs are being done, which are all at one end, that we could add the quarter-round windows (thank you, Lee). The owners left the east coast of Georgia and moved further inland because they were tired of having to deal with hurricanes and they're anxious to sell. I love those windows, they remind me of the eyes of jack-o-lanterns. The Amityville house looked a lot better with them. The new windows are just bland. It's called a gambrel roof. Thanks again. I tried to find it, but I didn't know how to word my Google search.